What is Grace Mugabe up to? She has got everyone guessing by stepping out of her role as a shopaholic and dairy-farming First Lady to start carving a political career for herself. Opra Michinguri, the powerful chairwoman of Zanu-PF’s Women’s League, recently stood down to allow Grace Mugabe to succeed her at the party’s annual congress in December. Her husband then lent her the intellectual gravitas that she otherwise conspicuously lacked by bestowing on her a PhD from the University of Zimbabwe, even though she had not passed her O-levels. The ‘rogues,’ whoever they might be, are of course right – at night. At 90, Mugabe is too old to save the country, not only because he lacks the drive but because investors don’t want to sink money into Zimbabwe while he remains in charge, with his dead man’s grip on the throttle, refusing to allow an orderly success process to unfold. This is keeping Zimbabwe on the downward economic spiral, which really took off after Mugabe and Zanu-PF won the elections last year. And so Mugabe really ought not to make himself available at the December congress as the party’s presidential candidate in 2018 – though that’s what Grace was implying he intends to do. So is Grace’s role merely to be the younger (by 41 years) and livelier embodiment of her husband’s seemingly immortal political ambition? Has he sent her forth, as the only person he can trust, to keep at bay the political hyenas who are circling ever closer as they sense his impending demise? Or is she part of a more subtle and complex political game? Many analysts believe that one of the two main rivals to succeed Mugabe is using her to advance their cause. The International Crisis Group (ICG) suggested in a recent report on Zimbabwe that the hardline Justice Minister Emmerson Mnangagwa was behind Grace Mugabe’s bid for the Women’s League job. His purpose was to thwart the ambitions of Vice-President Joice Mujuru, his chief rival to succeed Mugabe, who has been gaining popular support in other party structures, the report said. In an article in Business Day this week, former editor Allister Sparks gave a different twist to that scenario. He speculated that Mnangagwa had persuaded Michinguri to step aside for Grace Mugabe to take over the Women’s League. Mnangagwa’s intention was to show Robert Mugabe, who apparently mistrusts him, that he could in fact be trusted to succeed him, as he would take care of his interests. Those who proffer this scenario believe it is the more moderate and widely acceptable Mujuru whom Grace Mugabe must have had in mind when she accused the Zanu-PF ‘rogues’ of conspiring with the enemy against her husband. Piers Pigou, the ICG’s Southern Africa Project Director, leans towards the interpretation that Grace Mugabe is a pawn in the succession struggle, probably of Mnangagwa. But he also notes that those trying to use her to advance their own ambitions could be playing a dangerous game, as some believe that Grace Mugabe might even see herself as a potential successor to her husband. President Mugabe might increasingly regard that as an attractive option, as the surest guarantee of protection for him in his dotage, if he does not die in office, and of the interests of his family, if he does. Pigou personally feels ‘the dynastic option is too late.’ Robert Mugabe might very well be happy to allow that perception to circulate, along with all the other possible scenarios, as part of his old game of keeping potential successors – and everyone else – guessing about his intentions, and therefore off-guard. The South African government, which is naturally keeping as close an eye as anyone on developments in Zimbabwe, seems to agree that if Grace Mugabe really does have the large ambition to succeed her husband, she doesn’t have a hope in hell. According to a government official, South Africa believes that ‘Zanu-PF is a serious party,’ and would not make such a frivolous decision as to elevate the untested First Lady – with no proven constituency of her own – to the top position. Pretoria seems to see a rather different scenario from other analysts, though, believing the pertinent question is not who is backing Grace Mugabe’s political ambition, but whose political ambition she is backing. ‘It’s going to depend on which side – Mujuru’s or Mnangagwa’s – Grace throws her weight, and whether she can develop a political constituency,’ the official said. The implication of this interpretation is that Grace – presumably coached by Robert – is trying to position herself to be an indispensable ally of whoever is in power when his wanes. Like most outside observers, Pretoria believes that Zimbabwe cannot be saved while Mugabe remains at the helm, as he is such a deterrent to the foreign investment which is so indispensable to refloat the economy. It follows that Pretoria therefore also seems to favour Mujuru as Mugabe’s successor, because she seems much more likely than Mnangagwa would be to break with Mugabe’s fatal legacy and to the more moderate policies that would repair relations with the world. It is likely that Mugabe would prefer to be succeeded by Mnangagwa than by Mujuru, to protect his legacy. 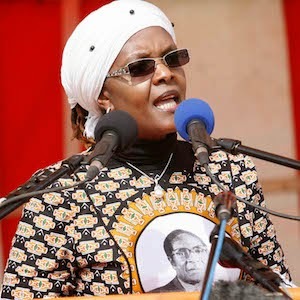 So, whether one chooses the more flamboyant dynastic interpretation – that Grace Mugabe cherishes her own presidential ambition – or takes the more mundane view that she is backing Mnangagwa’s ambition, the result could be much the same: to safeguard Robert Mugabe’s legacy. That being so, the more Grace Mugabe succeeds, the more Zimbabwe will fail.